"Franchise" stars haven't lived up to their names in recent times. WithÂ Dwight Howard's nightmarish tantrum and Kevin Love's frayed patience in mind, all small-market teams should now legitimately fear their superstars bolting for greener pastures. The Portland Trail Blazers are no different. As a small-market team, they too will face challenges keeping their franchise player LaMarcus Aldridge. Add in their recent fall to the rebuilding zone, and the challenges become magnified. Rebuilding periods coinciding with athletic pinnacles can be a powerful catalyst to franchise stars deserting their home teams. Too many superstars have fled their teams in fear of wasting their primes on lesser teams with low chances to win rings. Dwight Howard and LeBron James come to mind in recent memory. The same could happen to LaMarcus Aldridge. He's entering his utmost prime at 27 years old and will look to be in a contending squad, not a rebuilding one. As a competitive athlete seeking to be the best, Aldridge will surely abhor wasting his valuable heyday away on a losing team without a clear path in the immediate future. Will LaMarcus Aldridge stay in Portland? Yes, he is loyal and will stick around. No, he will be too unhappy with the team. Another possible strategy for the Blazers to appease Aldridge will be laying out blueprints and making aggressive moves to improve his supporting cast. This summer's daring moves, including offering a max contract at All-Star center Roy Hibbert were ineffective but impressive nonetheless. Continuing to make such sharp moves will help both the team and Aldridge himself. Some superstars are simply disgruntled at playing in small markets. Fortunately, Aldridge is not one of them.Â Ever since his two-year tenure in Texas, where he turned down NBA offers and returned after his freshman year, Aldridge has built a reputation as a loyal player, sometimes sacrificing time or money for his team. If the Blazers take care to put effort in improving the team as much and as soon as possible, Aldridge will see no reason to harm his reputation, abandon Portland and bolt for a bigger and better team. While the future seems murky in Portland, successfully retaining Aldridge will foreshadow a bright future. Well, it's about time. "The Fastest Man in Football" is finally getting his due. Rob Moseley of The Register-Guard (Eugene, Ore.) has tweeted that De'Anthony Thomas will be on the cover of this week's Sports Illustrated with the heading: The Fastest Man in Football. See the photo below. Perhaps, it took Snoop Dogg or Snoop Lion or Snoop Whatever to call out USC for letting Thomas get out of Los Angeles. Or maybe, the people at Sports Illustrated just know their college football. 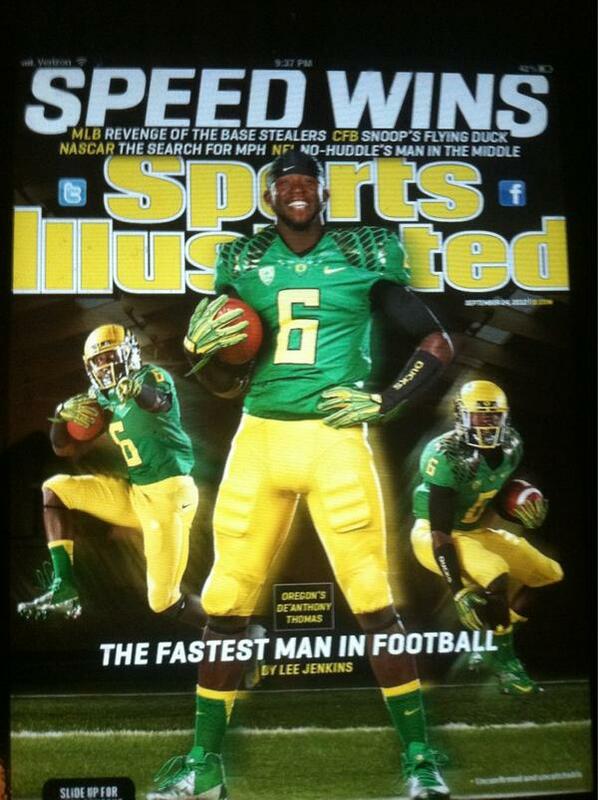 The truth is that DAT has been lighting it up for the Oregon Ducks. He is, quite literally, a threat to score every time he touches the ball. In three gamesâ"and he's barely played until halftime in eachâ"Thomas has rushed 13 times for 228 yards andÂ four touchdowns. On the receiving side, he's caught 11 balls for 154 yards and three TDs. Thomas has also fielded seven punt returns (most teams kick far, far away from him) for 93 yards. He has yet to run back a punt return for six, but it's only a matter of time. Thomas is electrifying, unstoppable and just plain fun to watch. If there is a better player in all of college football today, let him show himself. Please follow Kay Jennings on Twitter: https://twitter.com/KayJenningsPDX. The contest between these two teams will feature two spread offensive attacks that should provide for a lot of fireworks to finish off what should be a great day of college football. What Happened to the Ducks Last Week? The Oregon Ducks finished up their non-conference schedule by throttling the Tennessee Tech Golden Eagles by a score of 63-15. While the Ducks did drop down 7-0 after De'Anthony Thomas deflected a punt, the Ducks used 49 straight points to surge back into the lead and prove that there would be no upset on Saturday afternoon. Marcus Mariota completed 21 of 28 passes for 308 yards, four touchdowns and one interception while De'Anthony Thomas continued to flex his versatility, as he racked up 222 all-purpose yards and two touchdowns. Though they did come out with a big victory, sloppy play at times coupled with more than a few penalties really cast a shadow on what was yet another blowout win for the Ducks. What Happened to the Arizona Wildcats Last Week? The Arizona Wildcats completed their non-conference schedule with quite the win against South Carolina State, blanking the Bulldogs 56-0. Though not much can be said about the Bulldogs football program, Matt Scott and the Wildcats looked impressive in their final primer before Pac-12 play. Scott completed 30 of 36 passes for 288 yards and three touchdowns while also rushing for 61 yards and a touchdown on nine carries. The Wildcats also held the Bulldogs to just 154 total yards on the day, a defensive effort they will have to replicate if they want to have a shot at beating the Ducks. What Does This Game Mean for Both Teams? For the Ducks, this game means the chance to finally prove to the nation that they are the team they are hyped to be as they finally play a decent opponent in No. 22 Arizona. Though there are better teams out there than the Wildcats, Arizona will pose Oregon's greatest test and will give the Ducks the opportunity to showcase their strengths and weaknesses against comparable competition for the first time this year. For the Wildcats, this game is the chance to prove their worth and show that they can be a legitimate contender in the Pac-12 South. While not too many people believe the Wildcats can pull away with a victory in Autzen, if they do, they would suddenly become one of the more dangerous teams in the Pac-12 and further enhance the strength of this conference in 2012. If you get him the ball, De'Anthony Thomas will score. Arguably the most versatile player in the nation, Thomas looks to be even better in 2012 than he was in 2011. Should Arizona be able to crack the Oregon defense, De'Anthony will once again have to put the game on his shoulders with big plays as he helps march the Ducks down the field. Matt Scott has had somewhat of a breakout season in his first year as a starter for the Arizona Wildcats. If the Wildcats are to have any chance in this game, they will need Scott to play virtually flawless. He will have to zero-in on his receivers and pick apart the Oregon secondary, a unit which is perhaps the weakest link in a talented Oregon defense. While the Ducks will put up points nonetheless, allowing constant pressure on Marcus Mariota coupled with costly penalties will give Arizona the chance it needs to steal this game away from the Ducks. The Arizona Wildcats will win this game if the Ducks do not shore up their sloppy play and penalties as well as receive production from their new standout quarterback, Matt Scott. Compounding penalties, in addition to turnovers, should be more than enough to give Scott and his offensive weapons the chance to move down the field and put up points at a rate faster than the Ducks'. Though Arizona may test the Ducks for awhile during this game, Oregon will ultimately flex their muscle and come out with the win. Oregon Ducks Football: Like this team? Kip Kesgard, community bloggerWant to potentially work next to one of these guys up close? Check out the Stand Together Week 2012 site that lists 40 different projects supported by the Portland Timbers and their corporate partners where volunteers are needed. 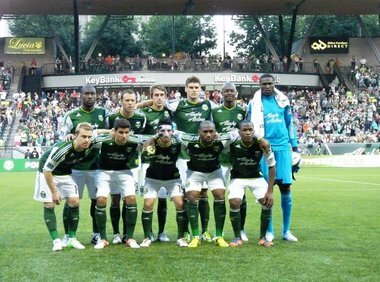 The Portland Timbers are nearly done with their 2012 season on the pitch with just six matches remaining in the schedule, but the team wants to make a big splash in the last month of the MLS season within the community. The team has also announced the results of their fall community grants, where eight different organizations will receive just over $43,000 in grants to help fund various projects. The Timbers along with their corporate parnters at JELD-WEN Windows & Doors, Alaska Airlines, adidas, Fred Meyer, and KPTV Fox 12, are organizing Stand Together Week 2012 as a call to the community at large to get involved with helping others. Between October 8 and October 14, the week of service will consist of 30-40 volunteer projects with various nonprofit organizations throughout the city involving approximately 1,000 supporters, including Timbers players, coaches, ambassadors and front office staff. Each project attempts to have a meaningful impact on the community with an overall focus on benefitting youth and the environment. You can visit the Hands On Portland website to review the complete schedule of events and to sign up for the chance to interact with fellow Timbers supporters, a Timbers ambassador, player, employee, or even Timber Joey. While each projects requires a $30 registration fee per volunteer, which counts as a donation to Hands On Greater Portland to help cover the cost of organizing this week of service, each participant will receive a commemorate Stand Together scarf and adidas drawstring bag as a thank you. In keeping with the theme of giving back, the Timbers also announced that eight family and youth-focused, nonprofit organizations throughout the Portland area will receive grants through the Portland Timbers Community Fund (PTCF). The eight fall grant recipients were selected by the Portland Timbers Community Fund Advisory Board and supported by the team and founding partners JELD-WEN Windows & Doors, Alaska Airlines, adidas, PGE and Burgerville. The PTCF presented grants to AC Portland, Big Brothers Big Sisters Columbia Northwest, Lower Columbia River Estuary Partnership, Parrot Creek Child and Family Services, p:ear, Portland Reading Foundation, Trillium Family Services and Young Entrepreneurs Business Week. Since 2011, the Portland Timbers numerous grants to various groups throughout Multnomah, Clackamas, Washington counties in Oregon and Clark County in Southwest Washington that promote youth education, youth sports, youth health and health, and environmental consciousness and activism focusing on youth and families. The PTCF set an aggressive goal of donating $180,000 in grants to local nonprofits and field projects in 2012. The fall grants are the third and final round of three grant cycles over the course of the year. For more on the PTCF, including a full list of eligibility requirements or to submit an application for your organization, visit the Stand Together website. AC Portland will use its grant money toward funding its spring and fall soccer camps, special programs such as a Poetry Slam and SHOUT and youth coach training. The grant awarded to Big Brothers Big Sisters Columbia Northwest will go to the Sports Buddies Program, which provides opportunities for at-risk youth to learn and participate in a variety of sports to help with their physical and emotional development. Lower Columbia River Estuary Partnership (LCREP) will apply its grant money to its Outdoor Education Program during the 2012-13 school year in its two major components â" science-based classroom lessons and outdoor fieldtrips. The funding given to Parrot Creek Child and Family Services will help renovate its current outdoor basketball court and turn it into a multiuse sport court for varying activities. p:ear, a mentorship organization, will use their grant to support field trips, educational materials, food and gear supplies for fall and winter recreation experiences including hiking, rock climbing, sea kayaking and cross-country skiing. The Portland Reading Foundation received funding to help implement its reading team model, which helps train two parents from each participating school community with the skills needed to teach students to read. The grant given to Trillium Family Services will be used to equip a newly constructed soccer field with goal posts and nets, covered viewing areas and team benches, and a weatherproof storage shed. Funds awarded to Young Entrepreneurs Business Week (YEBW) will go toward student outreach efforts targeting under-represented groups across Oregon. Thomas Boyd, The OregonianThe Timbers lead the Cascadia Cup derby with 8 points; the Sounders have 5 points. The Portland Timbers might not make the MLS playoffs this season, but after earning a 1-1 draw with the Seattle Sounders, the Cascadia Cup is still very much within reach. With two road games remaining against their Cascadia rivals, the Timbers hold a three-point lead over Seattle and a six-point lead over Vancouver. 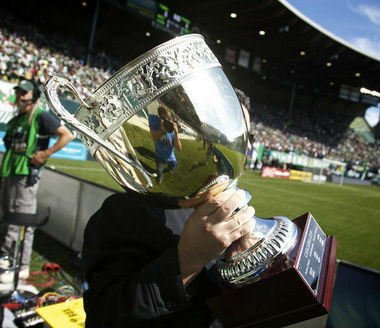 A draw against the Sounders on Oct. 7 would clinch the cup for the Timbers. [Songoâo] had pretty creative stretches at times but [in my humble opinion] he still must work towards varying his penetration to the 18. The more predictable he becomes in routinely dribbling to the top of the 18 the more defenses will cheat on him and make him less effective. Having [Steven] Smith as a counter-foil, or a more clued in [Rodney] Wallace will strengthen that left side penetration. This was his best game in a while as it looked like he returned to 2011 form, especially with him taking the corners late. After 27 regular-season games, MLS's ratings on NBC Sports Network were up 101 percent in average viewership compared to the 2011 regular-season average on Fox Soccer (137,000 vs. 68,000). The rabid fan base cannot be replicated across the country, but there are lessons about giving a first-team feel to the reserve league that might be transferred to other MLS franchises. "I think clearly what's going on in Portland shows what the reserve league's potential is," MLS President Mark Abbott says. "They have had some decent draws up in Seattle and occasionally in some other places, but nothing like we're seeing here in Portland." Check out the highlights from the Timbers Reserves 3-2 win over the Sounders Reserves on Sunday. â¢ Jimmy Conrad, a former four-time MLS Best XI and 2005 MLS Defender of the Year, attended the Timbers-Sounders match and "became a full fledged member of the Timbers Army, No Pity scarf and all." Watch the video of his initiation. "They expect perfection from just about everything you do ... everything you do is under a microscope. They expect you to act like a professional, and they treat you like a professional. There's more expected of me so I feel like I'm playing each day like there's more expected of me, and that keeps me developing as a player." â¢ Patrick Dorsey of ESPN.com highlights the latest marketing campaign of the Timbers geared to 2012 season-ticket holders. The video series is titled "RCTID" (Rose City 'Til I Die) and he embeds all the videos. "I think the team played well (against Seattle), and we just got to build from this performance," Wallace said. "(It is) unfortunate that we didn't get the win, but we just got to keep fighting and keep grinding it out." The Portland Timbers could take another toward joining an exclusive club they'd just as soon avoid. 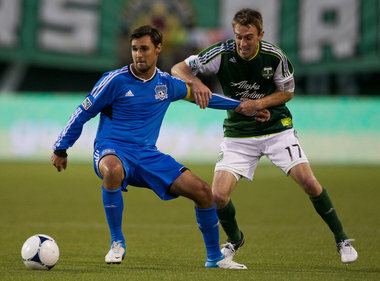 The Timbers' game at San Jose Wednesday night is first of the team's final four road games for the 2012 season. The Timbers are winless (0-10-3) away from home this season and frankly, the prospects of winning a road game look remote. If the Timbers lose their next four games and finish the season winless on the road, they would join Vancouver (2011), New York (2009), Real Salt Lake (2005) and Los Angeles (2003) as the only teams to go winless on the road during a season in league history. "We have failed on the road. We've struggled," Portland general manager and interim coach Gavin Wilkinson said. "It's a chance for us to continue to evaluate players and continue to look at ways to move forward as an organization and see if we can start to solve one or two problems." Wilkinson added that this stretch of the schedule - three games in eight days - will mean changes in the starting lineup, but he declined to get into specifics. It's likely that forwards Kris Boyd and Danny Mwanga, midfielders Eric Alexander and Lovel Palmer, along with center back Futty Danso, could all see action against the Earthquakes. "We know that we haven't won on the road, but it's something that's not fazing us at this point," midfielder/defender Rodney Wallace said. "We're just focusing on doing the right things and getting a result in San Jose." Coming off the emotion and intensity expended during the 1-1 draw against archival Seattle, the Timbers must be careful not to experience a letdown against San Jose. "Sometimes, after a big emotional rivalry game, there could be a lull. 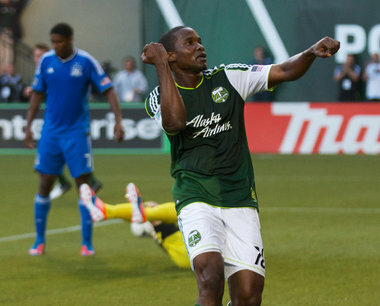 We have made sure to make a point of that," said Jack Jewsbury, midfielder and captain. "Everybody is aware that you don't want that to happen." "It's not something you want, going without a result on the road," Wilkinson said.